These Merry Christmas greeting cards will spread good cheer and joy to those people most important in your life. A Gorgeous light cream card wishes you a very merry Christmas in lovely water colour text. A pink banner announces whom the card is from and your photo is featured in the upper half of the card. You are welcome to include one more photo if you wish. 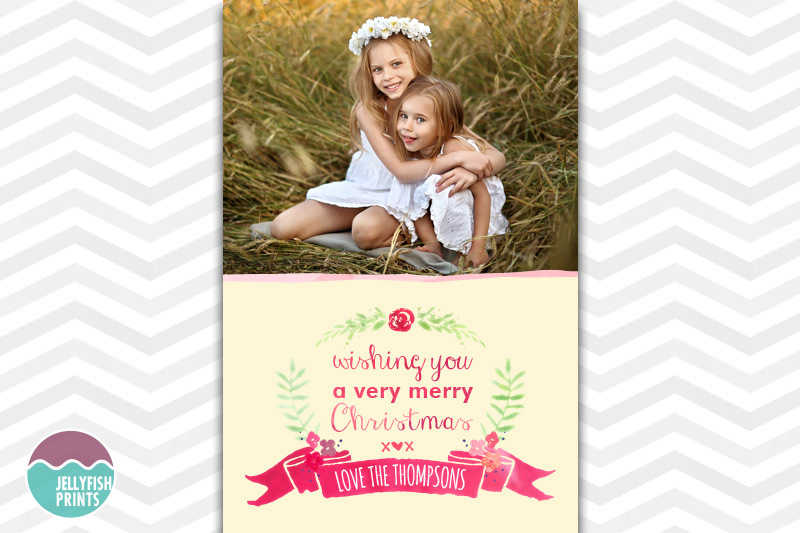 Customise this Merry Christmas greeting card with a photograph or two of your choosing. Any of the text and colours can be changed to suit your needs. We are happy to apply basic edits to enhance and improve your supplied photo – sepia toning, red eye removal etc. Please let us know. For the very best printing results you should should consider printing your photo cards at a photo lab or at big W, K-mart. The 4″x6″ cards are fairly inexpensive, around 10 to 25 cents per print. Your printable merry christmas greeting card design will be personalised with your information and photograph if applicable.